Michael Cohen will make several bombshell allegations about President Trump during his testimony on Capitol Hill Wednesday, including that he overheard political operative Roger Stone tell Trump during the 2016 presidential campaign that he had spoken to WikiLeaks founder Julian Assange about the release of emails stolen from the Democratic National Committee. While Cohen will offer scathing testimony against his former boss, he also claims he has no “direct evidence” that the Trump campaign colluded with the Russian government. Cohen will also testify that, contrary to recent BuzzFeed News report, Trump did not directly instruct him to lie to Congress about negotiations to build a Trump Tower in Moscow. Cohen’s 20-page opening statement was released Tuesday night ahead of his testimony before the House Oversight and Reform Committee. Cohen testified earlier on Tuesday in a closed hearing before the Senate Select Committee on Intelligence. Cohen’s claims about Roger Stone are perhaps the biggest bombshell contained in the opening statement. “A lot of people have asked me about whether Mr. Trump knew about the release of the hacked Democratic National Committee emails ahead of time. The answer is yes,” Cohen plans to testify. Cohen claims that in July 2016, just before the Democratic convention, he was in Trump’s office when Stone was patched through to Trump via speakerphone. “Mr. Stone told Mr. Trump that he had just gotten off the phone with Julian Assange and that Mr. Assange told Mr. Stone that, within a couple of days, there would be a massive dump of emails that would damage Hillary Clinton’s campaign,” Cohen’s testimony reads. “Mr. Trump responded by stating to the effect of ‘wouldn’t that be great,’” he added. Stone, a longtime Trump confidant, has long denied speaking with Assange or having advance knowledge of the release of DNC emails. He has also claimed he never spoke with Trump about WikiLeaks. Stone was indicted on Jan. 24 in the special counsel’s investigation on seven charges related to his House Intelligence Committee testimony regarding his discussions about WikiLeaks. Those charges center largely on his communications after WikiLeaks released DNC emails. The special counsel has mostly focused on what Stone knew about WikiLeaks’ plans to release emails stolen from Clinton campaign chairman John Podesta. Stone was slapped with a gag order on Friday, meaning that he cannot speak publicly about his case. Cohen says in his testimony that he has no firsthand knowledge that Trump or his campaign colluded with Russians to influence the election. “Questions have been raised about whether I know of direct evidence that Mr. Trump or his campaign colluded with Russia. I do not. I want to be clear. But, I have my suspicions,” Cohen will say. The statement, if accurate, would undercut allegations made about Cohen in the infamous Steele dossier. The 35-page report, which was funded by the DNC and Clinton campaign, claimed that Cohen visited Prague in August 2016 in order to pay off Russian hackers who had stolen DNC and Clinton campaign emails. Cohen has denied the dossier’s allegations, most recently on Dec. 27, after McClatchy reported that Cohen’s cell phone pinged off of a tower near Prague around the time the dossier claims he was there. The possible collusion that Cohen claims to have witnessed involves an infamous meeting held at Trump Tower between Donald Trump Jr. and a group of Russians in June 2016. Trump Jr. hosted the meeting after an associate emailed him to say that a Russian attorney wanted to provide the campaign with derogatory information on Hillary Clinton. “If it is what you say I love it,” Trump Jr. responded to the offer. The meeting’s attendees, which included Jared Kushner, Paul Manafort, and the Russian delegation, have all claimed that the meeting was a waste of time. They’ve said that the Russian lawyer, Natalia Veselnitskaya, used the introduction to the campaign to discuss one of her pet issues: the Magnitsky Act. The attendees have claimed that no information about Clinton was exchanged and that there was no follow-up to the meeting. Cohen says that he believes, but does not know for certain, that Trump Jr. told his father about the meeting before it occurred, a claim which Trump Jr. denies. “Ok good…let me know,” Trump replied. Cohen also addresses allegations reported by BuzzFeed that Trump instructed him to lie to Congress about efforts to build a Trump Tower in Moscow. Cohen pleaded guilty on Nov. 29 to lying to Congress by claiming that negotiations to build the skyscraper ended in January 2016. Cohen admitted that he worked through June 2016 to try to make the deal happen and that he spoke frequently with Trump about the project. BuzzFeed News reported in January that Trump directed Cohen to lie to Congress, and that he has told the special counsel as much during his dozens of hours of meetings with prosecutors. BuzzFeed also reported that emails, text messages, and witnesses at the Trump Organization would corroborate Cohen’s testimony. The report proved controversial after the special counsel’s office issued a statement saying that the story was inaccurate. BuzzFeed has stood by the story but not followed up with additional details to back up the original article. Cohen will testify that Trump did not “directly” instruct him to lie to Congress. “Mr. Trump did not directly tell me to lie to Congress. That’s not how he operates,” the opening statement reads. “In conversations we had during the campaign, at the same time I was actively negotiating in Russia for him, he would look me in the eye and tell me there’s no business in Russia and then go out and lie to the American people by saying the same thing,” Cohen will say. 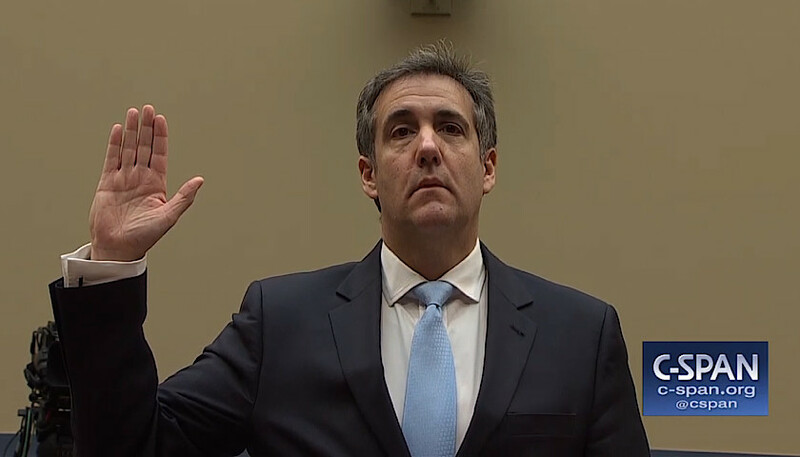 Photo “Michael Cohen Testimony” by CSPAN.